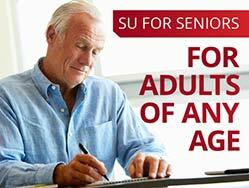 REDDING, Calif. - Simpson University for Seniors is offering two courses in January for adults of any age. The non-credit, no-homework classes, which begin Jan. 6, are taught on Simpson’s campus by university professors and professionals in their field of expertise. Classes meet from 10:20 to 11:20 a.m. and 11:30 a.m. to 12:30 p.m. on Mondays, Wednesdays and Fridays. 10:20-11:20 – St. Paul: The Man and his Message. St. Paul is a figure in history whom people perceive in a variety of ways. This course will discuss Paul and at least one of his letters in seeking to understand who he was and what he said. Presenter: Jack Painter. 11:30-12:30 – Healthy at Any Age: Mind, Body, and Spirit. This course will cover a fundamental approach to brain, body, and spirit health. Topics include include easy-to- follow exercises for the body and mind, innercise to uplift the spirit and reduce stress, and nutrition and meal planning ideas. Presenter: Jami Hanna.